Val's new "Girlfriends" patterns are here! Valori has been working in collaboration with Nick Coman to develop a new series of fashion patterns called Girlfriends. The first patterns in the new series are designed to work with Val's wonderfully soft & drapey jersey knit fabric! Introducing the first two patterns in the Girlfriends series: "Sondy" and "Isabelle". The Sondy Top is an up-tempo style with a cowl back neckline and three-quarter sleeves. It can easily be lengthened into a tunic or a dress. Pattern includes all sizes from Small to XXLarge. The Isabelle Skirt is a six gore style with a little bit of a flip at the hemline. The elastic waistline makes it easy to construct and comfortable to wear. Make it with one fabric or several. Pattern includes all sizes from Small to XXLarge. Girlfriends patterns started with a desire to create fresh everyday wearables with a boutique feel...All of our designs have a little bit of whimsy to make them stand out in a crowd, without being a “statement.” We have used the most current fabrics available (and we think the nicest!) to give you a starting point, be creative! We hope you enjoy wearing our designs as much as we have enjoyed creating them. Click here for Val's tips on working with jersey knit! My heart and my soul belong to the Metolius basin. larch, fir and aspen trees that grow so majestically along the Metolius River. raw-edge and hand appliqué as well as machine and hand quilting. 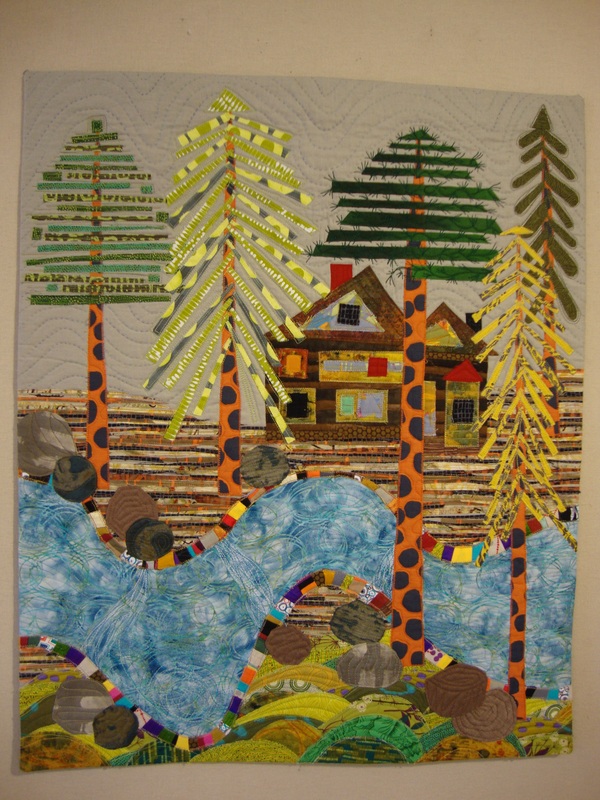 Quilt for Two Rivers is a project of the Sisters Outdoor Quilt Show, U.S. Forest Service, and the National Forest Foundation, funded by US Bank with the participation of the Deschutes County Cultural Coalition, the Oregon Arts Commission and the National Endowment for the Arts. Ok~ quick math here: 252 billion seconds ago is roughly eight years, which is approximately when I started this quilt! I finished the quilt top by the final day of class and actually had quilted several lines of "in the ditch" quilting along the sashings. That's when I decided this quilt was just too big for me to handle on my basic Kenmore machine. I talked to a long-arm quilter who said if I picked out the "invisible thread" quilting I had already done, she would be happy to quilt this for me...by the time I finally got around to and finished "un-quilting", she was no longer quilting for hire! Last year I hired Cindy, from here at the Stitchin' Post, to do the quilting. She did a fantastic job making each block special, with beautiful feathery hearts & circles. Cindy has a great eye for visualizing what quilting motifs will look best in each area of a pieced top. So the quilt has been sitting in a corner of my sewing room for yet another year, quietly whispering "binding...binding...binding." Now finally...this is my first UFO of 2012. I didn't quite make January, but I'm just so happy to have this quilt finished. It was an anniversary gift to my husband in 2004, when it was just a finished top. It was a birthday gift to him in 2011 when it was three layers quilted together. And this week it was a Valentine's gift to him in 2012 as a finished quilt. He's waited a long time to snuggle under this quilt! David Butler fabric has arrived! David Butler (husband of Amy Butler) is no stranger to design and the textile industry. As the designer behind the brand "Art of the Midwest," David has an extensive list of familiar clientelle. This is his first line of fabric called "Curious Nature" which is produced by Free Spirit under the design name of Parson Gray. "Curious Nature" is the first collection of prints from Parson Gray. The collection is a folk modern interpretation of natural elements. It weaves together a balance of hand-drawn patterns inspired by Japanese indigo and mid-century fine art. The palette is grounded in richly muted nature tones evoking deep forest and dark ocean balanced by bone ivory and oyster grays. Parson Gray's "Curious Nature" is being interpreted to fabric by FreeSpirit in both quilting/fashion and larger prints on Home Décor weight cotton. As David's new brand will offer a unique voice to a predominantly male audience outside of the fabric and quilting industry, his hope is that these fabrics will appeal to both women and men seeking modern, naturalistic, artistic style. Masculine yet clean, earthy yet chic, geometric yet natural. No fish, no animals, no sporting goods...I love it! Meet Suzy! Here she is with her recently quilted Log Cabin In The Round~ It's so beautiful! Our very own talented Cindy Y. did the long-arm quilting. Great job to both ladies! Andrea and Val have been busily redesigning the yarn department! They have been moving fixtures and tables, making the entire department very spacious and more comfortable for customers and our Wednesday Knitters! If you're available on Wednesdays, join us for Sit & Knit (1-4 pm or 5-7 pm.) Bring a project to work on while enjoying a spot of tea and making new friends. Or, just stop by and say hello~ the conversation is always very lively! This is one of the coolest things I have seen in a while (...and I get to see some pretty cool quilted items around here!) Can you guess who made it? Jean brought this awesome chair into the store Thursday morning! She started it just after Christmas and worked a little bit at a time between her other numerous projects. The chair will reside in the entry of her artfully decorated home. Jean machine-pieced the covers for the chair, and then fashioned them into a slipcover (which can be removed if necessary for laundering.) Most of the construction of the slipcover was also done on a sewing machine. Only a small section needed to be hand-sewn to create the curved corners for the top of the chair. You can learn more about this type of quilting in Jean's book Intuitive Color and Design. Jean doesn't have any plans to move into the upholstery business, but it is always fun to create new quilting challenges~especially when they turn out this great!